I will say not one bad word about Sam Smith’s in this review. Someone else wants to talk around that issue, but safe to say that as someone with a large social group of varying incomes, Sam Smith’s pubs being cheap has always been a factor. The John Snow in Soho is one of those pubs we rarely go to these days (in the area the Shaston Arms or Star And Garter get more visits) but hasn’t really changed, and holds a firm and fond place in our memories. I probably pop in there a couple of times a year and have whiled away a fair few hours with a pint of Hefeweisse reading about the good Dr Snow upstairs. So things to note. The John Snow is named after John Snow the health campaigner, not the newsreader, which is amusing in itself as John Snow was a confirmed teetotaller*. The pub is near the pump that Snow brought fresh water into Soho thus sorting out the cholera epidemic. This marks it out in Soho already, for an area with a pretty full history an awful lot of the pubs are highly anonymous. Another key point about the Snow is its compartmentalisation. I started drinking after nearly all the separate bars in pubs had been knocked through so there is something really rather nice about seeing various rooms in action in the Snow. Not that the John Snow is precious about it, the weeny door downstairs notwithstanding its an easy and compact pub to navigate. Indeed its size has sometimes worked against it. A regular FT correspondent was supposed to meet us for the first time in there. It was too full so we decamped down the road, his memories of the John Snow are of disappointment. It is a pub of first meetings, and often drinks there spiralled into odd areas. One night a bunch of us were sitting downstairs shooting the breeze (I guess early 2005) and slowly realised that the blokes on he table next to us were having some sort of UKIP meeting. Somehow we got embroiled, and suddenly it turned from a night of firendly banter into THE MOST IMPORTANT ANTI-FASCIST BATTLE IN THE BRITISH ISLES SINCE MOSLEY GOT HIS ARSE KICKED IN THE EAST END. Or something like that. They walked away tail between their legs and UKIP are now a spent political force because of us a four pints of the Fatman. For me though the John Snow is synonymous with one of my favourite images of the 00’s. Pre-crossrail, pre-any kind of refurbishment of the Tottenham Court Road area, Centre Point was looking a bit run down. From the upstairs room in the John Snow there is a perfect view of the upper twenty storeys of this oft derided building, towering over Soho. 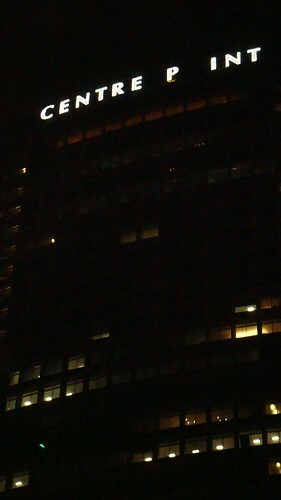 And in its run down state, one of the letters on top had not lit up. So proclaimed to all in the John Snow was the prophetic legend CENTRE PINT. Which is what the John Snow has always been for me. *Which the newsreader certainly isn’t. Indeed I have drunk in the same pub as the other John Snow on at least two occasions. My problem with the Angel is that you don’t ever feel like you’re actually indoors at any point. If feels like three version of those outdoor smoking areas you get these days, even the indoor bits. this is obvious nonsense DC, the Posh End of the Angel (which would have easily made a top 5 appearance in Smokiest Pubs of the 00s) has CARPET and everything, how can it feel outside? The Angel In St Giles just missed this list by a whisker! I have no photos of Tom In A Fez. Lets see what Google offers us. That illustration has the look of those in “The London Nobody Knows”, but I’ve not noticed the John Snow in there. Where’s it from? – a handy meeting spot for Wagamama when THAT was new and exotic and their edamame wasn’t ridiculous and their dumplings were better and well on saying that I still end up going there sometimes. Apparently the first one opened in ’92 on Gower Street – anyone know where exactly? It is also the only pub in which I have played link up MARIO KART on the DS. So it is futuristic too. I have never worn a fez and gurned frighteningly at a camera, Steve must be thinking of somebody else. Hmmmm… but it seems so real. (anyway I have just realised they probably mean the Wags by the Oxfam bookshop and WHISKY SHOP, I have never been there and do not really consider that ‘gower street’ tho it probably is, who knows, anyway, shut up). According to my LJ, the UKIP incident was as long ago as July 2002. Bloody hell, 7 years, etc. etc. Yes the first Wagamama is by the Pizza Express near the British Museum. I remember going in the summer of 1992 and queue until 1993 to get a meal! 2002 for us vs UKIP. Yowsers! Whatever one might wish to say about Sam Smith’s, it’s surely better than Watney’s and its Red Barrel (from what I’ve heard; I’m too young to *know*). Beyond Red Barrel I am unfamiliar with the Watney’s range, but always loved the name and what it signified (I still love the Double Diamond logo etched in glass too). Pedantry: John Snow didn’t install the pump to supply clean water, he proved that the water from the pump was contaminated with cholera germs, and disabled the pump to stop it spreading any more (by taking away the pump handle). The pub is directly on the site of the house where patient zero, Thomas and Sarah Lewis’s baby daughter, contracted cholera; the cholera got from her into the public water supply through a badly installed sewer pipe that let “abominations unmolested by water” build up only a few inches from the brick lining of the well. I once got pissed with Daniel Davies in this hostelry, and I recall someone shouting at me about being “just off to Kosovo with the Israelis”. IIRC, it wasn’t a sewer pipe but a poorly pointed and leaking cess pit wasn’t it? Trust me Ewan, you missed out on precisely nothing regarding Watney’s Bleedin’ Red Barrel. It tasted of bugger all except carbon dioxide. Up here in t’dark satanic north, Watney’s were single-handedly responsible for that old lie about all southern beer being rubbish, though we had a few keg bitters that were just as bad (the Freddie Trueman-advertised Webster’s Pennine Bitter being the worst; no coincidence that Webster’s were the Yorkshire arm of the Watney Mann empire at the time). I firmly believe that the death of Webster’s ushered in the last fifteen years rise in real ale. Re 6/8 etc, yes the original Wagamama is the one just off Bloomsbury Street, which up the road becomes Gower Street, hence the confusion (or slack Wikipedia entry). I spent the summer of ’92 living either in the building above it or the one next door, and can confirm endless queues the whole time. Even with mobiles and all, finding the people you’re meeting in the Angel in St Giles can be a prolonged adventure. I used to drink in The John Snow with my brothers every Thursday night – about once a month you would get a Statistician in there, thinking himself KRAZY for having a HALF, who was DESPERATE to tell somebody, ANYBODY, about The John Snow Society. Not the same Statistician every month, different ones. Also, one of my brothers SWORE BLIND that one time he was there he saw The Other John Snow having a drink. We SCOFFED, but i hope it is true.